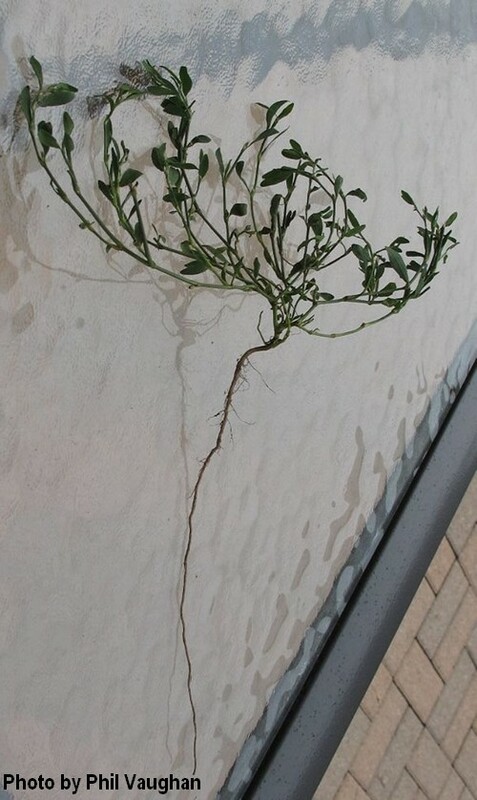 It has oval leaves, wiry thin stems, long tap root. Sometimes it can be easy to pull out but if the soil is hard and dry, that long root keeps it firmly rooted. 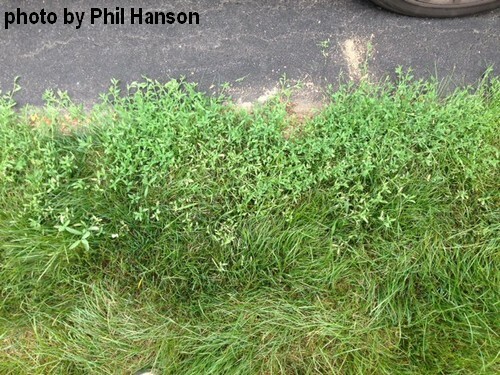 Common knotweed is normally not a huge problem in healthy turf. It is not easily controlled with the organic products available and allowed today in Ontario under the Cosmetic Pesticide Ban. Common knotweed tends to grow where the lawn is weak. It tends to do well in poor conditions. Let's say it tolerates conditions that grass does not like. Often it is prevalent along the edges of the lawn next to drives walkways or boulevards. This is often where the soil is hard and compacted due to compaction from tires and feet. Its long tap root allows it to tolerate compacted conditions. 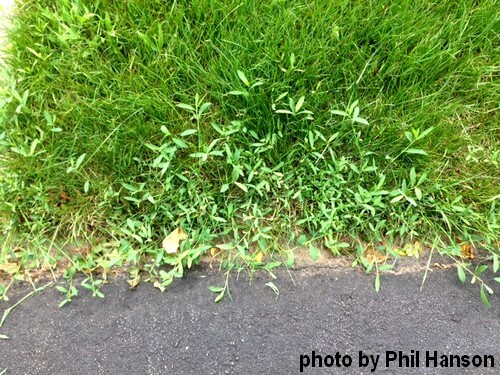 It is also commonly found growing in driveways as it will tolerate vehicle traffic. Often it is also found growing in areas where the lawn edges are suffering from excess winter salt. 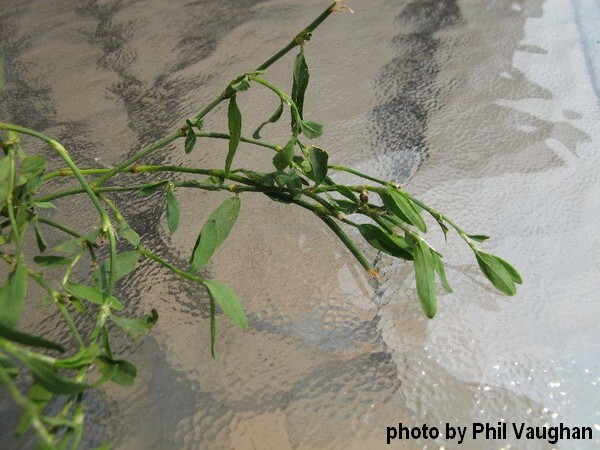 What can be done with common knotweed? First evaluate where it is growing. Is it due to the conditions of the lawn? Is the soil hard and/or compacted? If it is growing in hard soil- the best way is to try to address the soil compaction issues. First make sure the walk and drive is wide enough or in the right place- so as to reduce traffic going off the edge and onto the lawn and compacting the soil. Of course, sometimes that is not possible. Next, try to loosen the soil and then add some grass seed. 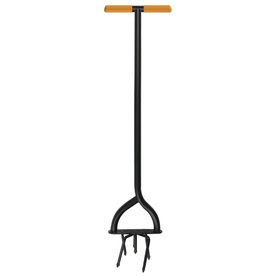 One way is by taking a spade and inserting into the soil about 3-4 inches, wiggle the spade a bit then pull it out. This is especially useful along paved edges as a core aerating machine is not likely to do a good job in close quarters. Step on this at the edge, give it a slight twist to break the soil loose. Once the soil is loosened, add some organic soil (like Black soil) and then sprinkle grass seed. Rake lightly to mix the seed into the soil. Water twice daily for 2 weeks until the seed is germinated. Scale back the watering after that but don't allow the seedlings to dry out until they are well established. Thanks to a couple of Phil's for their knotweed photos.